We recognise the way we handle personal information is important in maintaining the levels of trust and confidence to which we aspire. Personal information is acquired by Police in many ways and many forms. It is a highly valued and a key component of our work that enables us to prevent, investigate, detect and prosecute offending; and to keep our communities safe. We acknowledge that our work would be challenging without the trust you have in us to look after the information you give us, and to use it wisely and within the law. We also acknowledge our responsibilities to comply with the Privacy Act 1993. It includes management responsibilities for personal information within an agency like New Zealand Police. The way we manage personal information and the rights of individuals to have some control over it are spelt out in the following sections. When you report a crime or an incident we will generally collect sufficient information about you and the event to enable us to deal with the matter effectively. Participating in joint investigations with other New Zealand enforcement agencies such as the Department of Corrections, New Zealand Customs Service or Oranga Tamariki–Ministry for Children; or international enforcement agencies with whom we have a relationship. In many circumstances we will tell you why we are collecting information from you and what we will use it for. In some circumstances, the reason why we are asking you for your personal information will be obvious through our interaction with you. In other circumstances, giving personal information to us is, by law mandatory and we will advise you when that is the case and consequences of not doing so. An example is your obligation to provide certain information if we stop you when you are driving a vehicle. You may be obliged to provide us with your driver’s licence or your full name, address, date of birth, occupation and telephone number. You may be involved in activity where we may not tell you about information we have collected, particularly if to do so would prejudice our ability to maintain the law (including our role to prevent, detect, investigate and prosecute offences)(see examples under “Use and Disclosure). There may be circumstances where information is collected automatically for a limited purpose, such as Emergency Caller Location Information (ECLI). See the section about ECLI for further details. Unless we are permitted by law, we will only use or disclose your information for the purposes for which it was originally obtained. In some instances, the information may be forwarded on to others, and generally you will be made aware of those circumstances as the occasion arises, and if we are able to share that detail with you. Providing a vetting response to an agency that contemplates engaging you in its service. Sharing information with community members to enable us to investigate or prevent crime or crashes. We consider personal information is an important asset in achieving our purpose, vision and goals. Keeping information secure is vital to us, and we acknowledge that it is essential to keeping your trust and confidence in us. All of the information that we hold, whether it is in a digital or hard-copy form, is robustly secured both physically and technically; and we have expectations of our staff that they will actively contribute to keeping all of our information safe and sound. Staff that fall short of our expectations are held to account for their actions. Information is protected in accordance with the best industry practices that are available to Police on a commercial and reasonable basis. We also implement physical, technical, and organisational measures consistent with NZ Government security policy to prevent unauthorised access, unauthorised or accidental loss, destruction, or damage to your personal information. In the context of digital information, we use secure servers and any external server providers are scrutinised to ensure we acquire a level of security that adequately protects our infrastructure and which meets the exacting standards set out by the NZ Government security policy. We also require our staff to use personal information holdings for our business purposes only, and that they take all reasonable steps to ensure the information they intend to use is accurate, up-to- date and not misleading. The integrity of information is crucial to the way we conduct our business. The Government Chief Privacy Officer (GCPO) has issued core expectations in a Privacy Maturity Assessment Framework to assist government agencies to adopt good practices in the management and governance of personal information. Good practice, governance and management are significantly influenced by the nature and extent of the personal information that an agency holds. Details about all of our Police employees. Interactions with our information holdings are complex and important to how we serve our communities. We also acknowledge that the way we use personal information, and our overall stewardship of it, directly contributes to the trust and confidence which the public have in Police. Understandably, then, we are committed to improving our maturity levels in managing your personal information. In 2015/16 we reorganised the way we approach privacy and personal information. Privacy and security specialists within Police now share a Strategic Work Plan (PDF 336KB). Organisational security and privacy are also part of a broader grouping of assurance and integrity services, where responsibility for data quality, information and general security, organisational risk, audit processes and professional conduct are integrated. Our comprehensive Code of Conduct specifically requires all Police employees to consistently practice good judgement and integrity when dealing with personal information, and only use it for legitimate work purposes in line with the law, our policies, processes and systems. In 2014, the GCPO issued the Privacy Maturity Assessment Framework containing core expectations of government agencies to assist agencies to focus on good practice. 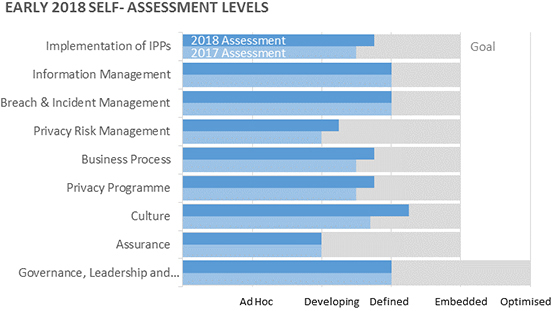 The Framework assesses the management of personal information against nine elements, a larger range of attributes and rates performance against a five-point maturity scale ranging from ad hoc at the lower end to optimised at the upper end. The above diagram outlines the 9 core expectations. Each element consists of a number of attributes and criteria against which privacy maturity can be assessed. Maturity is assessed through a continuum of five possible levels as shown on below. While the Privacy Maturity Assessment Framework core expectations are individually defined, they are linked and there are common themes running through them. We believe that work in three areas will significantly contribute to improved performance across all of the core expectations. The three areas for Police are risk and assurance; training; and data breach management. A dominant theme in the Framework is the need for robust risk and assurance practices. We recognise a shift in our risk and assurance practices will significantly lift our maturity around managing personal information. We will also gain benefit from refocussing and refining our training at all levels in Police to highlight our expectations in dealing with personal information. Lastly, we recognise that the nature of privacy breaches or incidents involving personal information reflect our maturity in managing personal information. The active reporting of all forms of incidents whether they be actual breaches or near misses, is a sign of a strong culture that learns from its mistakes. Continuous improvement is an important feature of the way Police does business. Our existing data breach and continuous improvement model will be strengthened, along with influencing culture changes that encourage active reporting. View our comprehensive policy on privacy breach management (PDF 340KB). We will evaluate our practices and maturity in managing personal information on a yearly basis and report the results in this site by updating the above diagram and the contents of the site where applicable. Our next evaluation will be completed by April 2019.
the last site you visited from which you accessed any New Zealand Police website. help make our site more useful to our visitors. to remember the options you selected when using a mobile device. you will not get improved browsing experiences that cookies enable. When do we collect personal information on the website? If you subscribe to a service through the website, we record your email address in a database. We use your email address only for the purpose of sending you the service. We will not disclose your email address to any third parties. Subscribing to news releases or incident alerts implies that you have given your consent to receive emails from us as defined in the Unsolicited Electronic Messages Act 2007. You can unsubscribe at any time by visiting the subscription page for the service you wish to terminate, entering your email address and choosing “Unsubscribe”. If you choose to provide personal information when adding material to the New Zealand Police website, it may be viewable by site administrators, certain Police staff and contractors (including third parties) providing administrative, maintenance or other services relating to the website. We do not currently run online forums or similar user-generated discussion sites viewable to members of the public, but in any case please do not transmit personal information of a sensitive nature through the website. it will be used in a way that will not identify you (for example, in the context of statistical or research work). You can ask to view or correct information we hold about you. Unless the staff member dealing with your access request knows you, we will ask you to identify yourself. We will need to sight a primary and secondary form of identification, one of which has to be a photograph of you. A form for this purpose is contained on our website. The form sets out how you go about establishing your identity. We will usually allow you to have access to the information that we hold about you, in the way that you prefer, unless there is good reason to the contrary. We will discuss the options with you. The nature of our information holdings means we may also responsibly withhold information from you in accordance with grounds set out in the Privacy Act. We will discuss that sort of outcome with you. We will always attempt to provide you with access to your information in a timely manner, but how long we take will always be dependent on the nature of your request, and the volume of information we have to deal with to meet your request. In responding to your request, we will keep in mind the expectations of the Privacy Act. If you are defending criminal charges in Court, your request will be managed according to the provisions of the Criminal Disclosure Act. You can request information or download a form to make the request. You can use the same form to ask us to correct information that we hold about you. The law permits us to decline to correct information where we do not believe any correction is appropriate. However we will assist you to have a suitable statement attached to the relevant record. If you have concerns about how we have managed your information you can lodge a complaint online by filling out our form and specifying the privacy concern you have. Where a caller is using an enabled mobile device, this device will automatically send high-precision location information to the emergency services. Where a caller is using any mobile device, the emergency call will trigger the sharing by network operators of lower-precision location information derived from the location of the cell tower closest to the mobile device. The system is managed by the Ministry of Business, Innovation and Employment and the process and system has been included in a Code of Practice issued by the Privacy Commissioner. The Ministry maintains a Location Area Service which processes ECLI and makes it available to Police and other emergency services. ECLI is automatically sent to emergency response agencies such as Police, local ambulance services and the New Zealand Fire Service. The ECLI will enable emergency response agencies to determine the location of the caller and an emergency incident. This will assist emergency response agencies to be more efficient and effective when responding to emergencies. Police will only hold the ECLI for the purpose of responding to an emergency call and will keep a record of the information that was relied upon to respond to the call. Check out our pages on “Calling Emergency 111”.